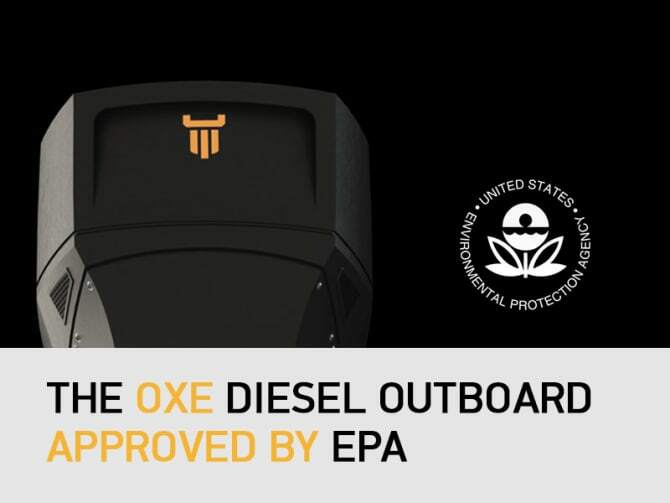 Cimco Marine is pleased to announce that its diesel outboard OXE has been approved by the United States Environmental Protection Agency (EPA). The OXE is the first diesel outboard engine approved by EPA Tier 3, for commercial use. The mission of EPA is to protect human health and to safeguard the natural environment – air, water and land – upon which life depends. With the right engineering Cimco managed to develop and supply the maritime industry with an uncommonly robust, fuel-efficient and environmentally friendly outboard. The EPA certification strengthens Cimco’s dedication to provide a sustainable and fuel-efficient diesel outboard. The OXE is a well proven diesel engine inherently more efficient than gasoline engines contributing to low fuel consumption. It consumes 42% less fuel than a comparable modern 200hp 2-stroke outboard. Cimco Marine is the marine manufacturer behind OXE Diesel – the world’s first high performance diesel outboard engine. Setting new standards for durability, fuel-efficiency and low emissions.